Sharing a SHE-HE-CHE-YA-NU MOMENT with you!! Several years ago (maybe as many as ten???) we replaced our front door. It was unpainted. 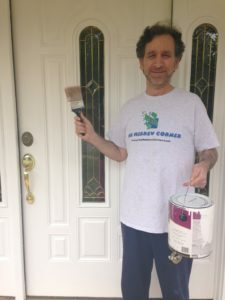 Every summer, Rabbi Allen would say… “I will paint the door THIS summer.” The summers came and went.. and the door remained unpainted. Well, this time he did it! YEAH!! That was a SHE-HE-CHE-YA-NU MOMENT!! SHE-HE-CHE-YA-NU MOMENTS can be big moments like the birth of a child or a bar or bat mitzvah, or they can be moments as simple as finally finishing a project you got around to doing. SHE-HE-CHE-YA-NU is the blessing we recite thanking God for allowing us to LIVE and enjoy a particular moment in time. Reciting the SHE-HE-CHE-YA-NU blessing is a way to bring holiness to THAT moment. Wouldn’t it be nice if every day were punctuated by a SHE-HE-CHE-YA-NU MOMENT? A lost tooth, learning to swim, finally riding that bike, moving into a new home, getting a 100% on a test. These are all moments to celebrate. SHE-HE-CHEH-YA-NU V’KEE-Y’MA-NU V’HEE-GEE-A-NU LAZ’MAN HA-ZEH. TO REACH THIS HAPPY MOMENT. And if you need help reciting the blessing, refer to this link.